Double Rainbow on Upper Yosemite Fall, originally uploaded by dmzajac2004-. Another waterfall from my Archives. 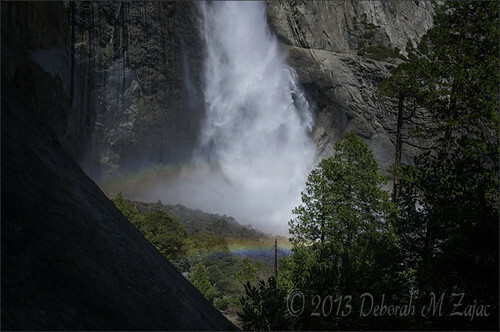 On my birthday in 2011 I hiked up Upper Yosemite trail and was rewarded with a Double Rainbow at the base of Upper Yosemite Fall. It’s a steep and arduous hike, but well worth the effort. Nikon D300s| Nikkor 1735@ 20mm| f5| 1/2000second| ISO 160| Manual Priority| Matrix Metering| Hand-held- there wasn’t much room for my tripod on this ledge.